A VA condominium ownership can have numerous benefits over home ownership; with a much lower monthly cost and attractive or convenient amenities, buying a condo with a VA loan could be optimal for some borrowers. However, not all mortgage loans can be used to purchase condominiums. Fortunately for VA-eligible borrowers, loans guaranteed by the U.S. Department of Veteran Affairs (VA) can be applied to condo purchase, provided the property meets certain criteria. To find out which condos qualify for VA funding, visit the U.S. Department of Veteran Affairs website, where you can locate a database of VA-approved condominiums. Input your prospective condo information to determine its eligibility. 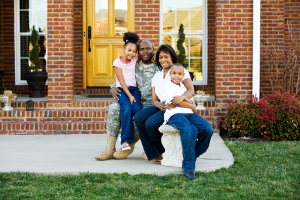 You can also contact a VA lender for more information. Amenities: Condo complexes often contain amenities such as swimming pools, gym and fitness facilities, clubhouses, and other unique community features. Cost: Purchasing and maintaining these types of conveniences within a home will be exceedingly expensive. However, condominium owners can take advantage of these services with minimal additional cost. Maintenance: Condominiums inherently come with regular outdoor maintenance, which is managed by the condo complex owners, rather than individual unit owners. Plus, some condominiums even include the cost of repairs for indoor maintenance. Security: Condominiums carry the feeling of safety, often including gates, security, guards, and close proximity to other residents. As many lenders enforce differing standards for condo qualification, borrowers should directly contact a VA loan professional to discuss their options. If you are looking for a reliable VA mortgage lender, visit our Lender411 Find a Lender page to conveniently locate nearby VA lenders in your vicinity. Start comparing loan offers today and take the first step toward a smart mortgage.